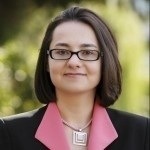 I recently interviewed Ekaterina Walter, social media strategist at Intel. Ms. Walter works in Portland and is part of a small team of social media specialists working closely with Intel's corporate marketing group to provide a set of best practices and strategies. Ms. Walter has been specializing in Facebook strategies. You can hear one of her BrightTalk webcasts here: "Faceless to FANtastic - Effectively Engaging Your Facebook Fans"
- My webcasts have been popular because I provide a lot of tips. - Engagement on Facebook is important. If you don't engage you don't grow. - We try to create a 3 to 5 year social media strategy at Intel. - My team advises the Intel marketing group and we have also created an internal education classroom series that all 5 thousand people in our marketing group have taken. - We don't monitor what Intel staff do in social media but we do have lots of support services for them. - It's important to collect content so it is not fragmented. For example, we have an Intel channel on YouTube where staff can upload videos. - Facebook is important to Intel because it is a place where people can get advice. We have more than 80 thousand fans on Facebook. - The old days of trying to drive everyone to your main website are over. - I am involved daily on Facebook but I would like to work more on strategy. However, if I weren't involved on Facebook I wouldn't know what Intel's strategy should be. - There is a return on investment in social media. It's hard but it's not true that you cannot calculate an ROI. - Analytics is very important. We use a lot of analytics tools, none are custom, all are available either for free or as a subscription. - We also work with Intel reseller partners, helping them sell more by using social media. - Many companies take a campaign approach to social media. That won't work, you have to realize that it is not a three month campaign but a long term commitment. - You have to know who you are trying to reach. If you are focused you will make an impact. - Video is very important in social media. It is highly consumable and many people prefer it over text. Also, video can transcend language barriers. Video also helps in search engine ranking. - It is very true that every company is a media company and also every consumer is a content producer. There is a lot of media being produced, there are a lot of distractions, and that's a challenge for any company. - Facebook allows Intel to move from a faceless brand to a human brand. Social Media is free. I cringe every time I hear that! Social media is NOT free when done RIGHT! That’s all there is to it! It requires commitment, hence it requires time and resources. Hire an intern to do Social Media. What a horrible advice! Social Media engagement equals a short-term program. The whole purpose of social media is to give you an opportunity of building long-term relationship with customers! Social Media should be outsourced. ... You should own the engagement! No one understands your brand like you do and cares about it like you do. You HAVE to be on social networking platforms. No, you don’t. Failure is not an option. Social media is all about trial and error. If anyone tells you they are an expert in the field, run. Everything in social media changes so much and so fast (especially the tools) that anyone would have hard time keeping up with all of it. You can’t measure Social Media. That is just an excuse! Is it hard to measure social engagement or social advocacy? Yes. Is it impossible? No. There are a bunch of great posts by Katie Paine; Olivier Blanchard and others that will tell you just that. And there are a lot of tools (free and not) that can help you with that. Social Media is having a Twitter (and/or Facebook) strategy. Having Twitter presence does not constitute a strategy.